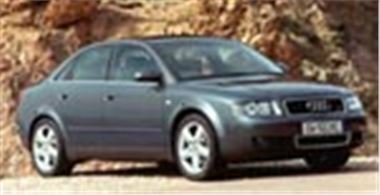 When it goes on sale in the UK on 1/3/2001, the new Audi A4 will be priced from £18,640 on the road, some £1,500 more than originally anticipated. £18,640 buys the 130bhp 2.0 litre petrol model, which is very well equipped with such items as alloy wheels, electronic brake force distribution, abs, electronic climate control, electronic stability programme, full sized spare wheel and a zinc electro galvanized body guaranteed not to rust through for at least 12 years. The 150bhp 1.8T petrol model will be priced at £19,810 and the punchy 130bhp 1.9TDI PD will be £19,940 on the road. The four wheel drive 1.8T quattro will be £21,210; the 220bhp 3.0V6 quattro will be £24,840; and the 180bhp 2.5 V6 TDI quattro will be £24,340. 'SE' specification pack which adds wider 16" alloy wheels, 'Concert' radio, driver's information system and leather rimmed steering wheel will cost an additional £610. 'Sport' specification pack which adds wider 16" alloy wheels, sports seats, leather rimmed steering wheel and sports suspension will cost an extra £900. More details of the car at the car by car breakdown on this website.